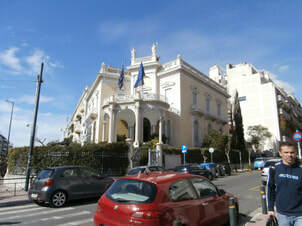 Kolonaki is an aristocratic neighborhood in central Athens situated at an exclusive location, encompassed by Syntagma Square, Vasilissis Sofias Avenue and the southwestern slopes of Lycabettus Hill. It was named after the ancient old column (the Greek for small column is kolonaki), found in the center of Kolonaki Square. 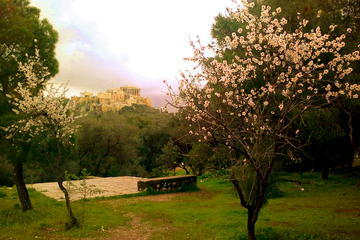 Kolonaki is a wealthy, chic and upmarket district, and a fashionable meeting area. Here, one may encounter green spots and attractive buildings, predominantly neoclassical and modernist, lending the area a distinguished character. As one of the capital's leading shopping areas, it includes a number of high-end boutiques from young adult to casual fashion to prestigious haute-couture from Greek and international designers. Here one will find some of the most expensive commercial shops, popular cafes and modern bars, as well as some luxury restaurants. 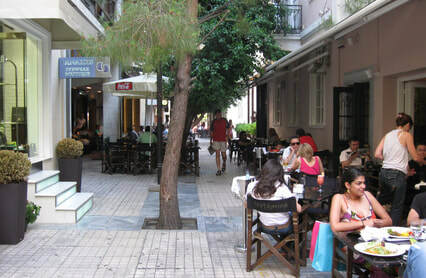 One of its main shopping streets, Voukourestiou, once the home of Galerie Zygos, is now mostly known for its jewelry. 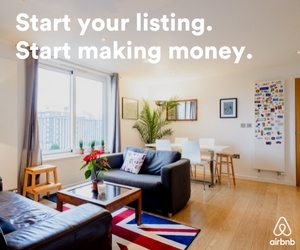 There are a plethora of available options for nightlife, including bars, bistrots, ouzeries, restaurants and tavernas. 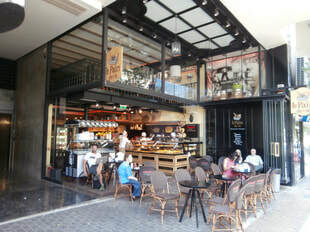 Trendy coffee shops, bars and premium restaurants can be found around the streets Kanari, Patriarchou Ioakeim, Tsakalof, Anagnostopoulou and Skoufa. Outdoor seating on pedestrian walks is typical, creating a lively atmosphere at night. The Lycabettus Funicular Railway, links Kolonaki to the summit of Lycabettus hill. Kolonaki is serviced by two metro stations, Evangelismos and Megaro Mousikis. ​St. 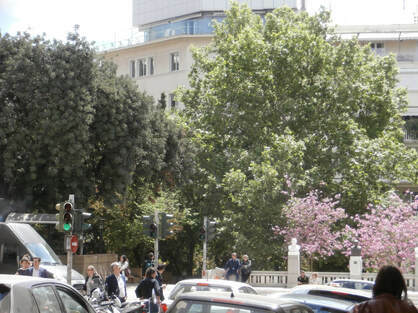 George Lycabettus, situated on Dexameni Square, and an excellent choice to walk all around Athens unless you have a mobility problem, since the hotel is located on a hill. St. George Lycabettus was just voted and have won the Gold Award as the Best Greek Lifestyle City Hotel at the Hospitality Awards 2017. It so happens that the hotel is built where the Mantzavelakis building used to be, where my own father used to live during the dark years of the German occupation. Another select hotel in the Kolonaki area is Periscope, a boutique city-hotel offering minimally decorated rooms and suites with state-of-the-art facilities. Each comes with free WiFi, a flat-screen TV, CD and DVD library, and pillow menu. Modern bathrooms are stocked with luxurious toiletries, bathrobes and slippers. Complimentary fruit, snacks, and beverages can be enjoyed all day in the lounge. Kolonaki Square, or Plateia, on an April afternoon. Lycabettus Hill, looks over the Kolonaki neighborhood. Museums and galleries abound in Kolonaki. The Benaki Museum, inside a preserved neoclassical manor house, and the Museum of Cycladic Art are two of the finest private collections in the country. Two smaller museums to be found in Kolonaki are the Museum of the History of Greek Costume and the Theater Museum. 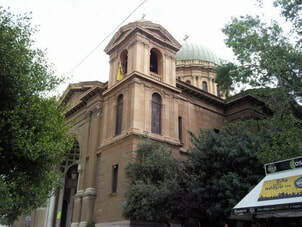 Across the street from Vassilissis Sofias Avenue are the Museum of Byzantine and Christian Art, and the War Museum of Athens. Busts of leaders of Filiki Etaireia. The one and only square of Kolonaki, offering some green respite and a couple of benches to rest, is named in the honor of Philikí Etaireía, the revolutionary secret society founded by Greek merchants in Odessa in 1814 to overthrow Ottoman rule in southeastern Europe and to establish an independent Greek state. 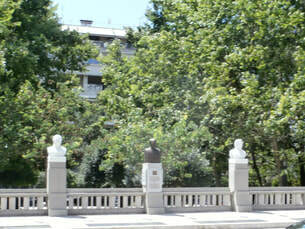 Busts and statues of prominent leaders of the society adorn the small park and remind Athenians that freedom did not come so easy! There are literally hundreds of stores within Kolonaki, covering all tastes and budgets. You may want to visit kombologadiko, a unique store on 9 Amerikis St., selling all sorts of quality worry-beads in various materials and techniques, or visit kombologadiko.gr. Le Pain de Vie bakery.